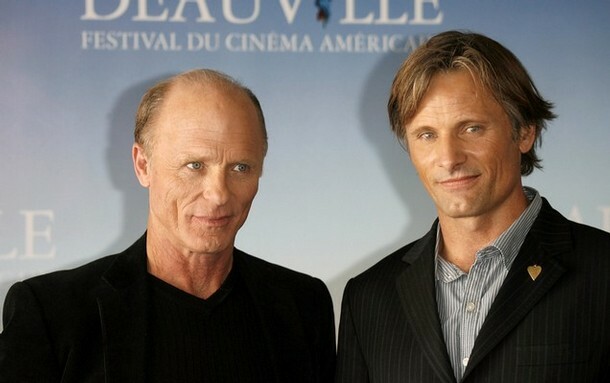 Ed Harris and Viggo Mortensen in France: WOW- talk about aging gracefully!!! Last Sunday afternoon, I was feeling a little down, so I went to check out a new movie I was curious about. (I wrote a previous post about Appaloosa.) I would catagorize it as a subtle, low-key Western drama. The small audience (mostly folks 50 and up) seemed to like the sly humor, in-depth characterization, and development of the female character (she’s not a one-dimensional woman like in traditonal Westerns). 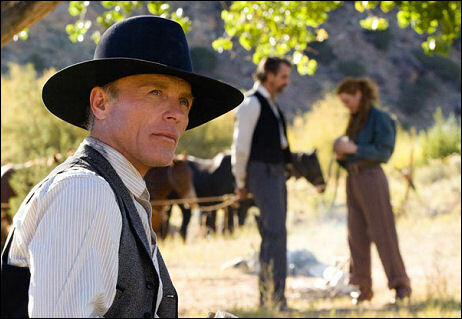 The stars are: Ed Harris (lawman for hire Virgil Cole; he also co-wrote the screeplay and directed), Viggo Mortensen (Cole’s quiet, observant, long-time partner in “gun work” Everett Hitch), Renee Zellweger (young widow Allie French), and Jeremy Irons (rich bad guy/rancher Randall Bragg). Cole and Hitch have been partners for many years. They have traveled through little Southwestern towns enforcing the law whenever called upon. Appaloosa is under siege by Bragg and his men; they drink too much, fight, don’t pay bills, and aren’t hesitant to use their guns. The town leaders (scared stiff by the mention of Bragg) think he may have killed the former lawman of the town. They quickly agree to the terms set by Cole (he carries his own list of laws), and he becomes marshall. 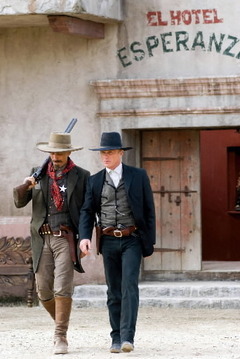 Hitch, who always carries a 12-gauge (a big gun), is his deputy. Into the town comes Mrs. Allison French, a pretty, young, well-mannered widow. She is cheerful and plays the piano, but hasn’t much money. Cole takes an instant interest in her; he says she can stay in the town’s hotel as long as she likes. Before you can say “Gunsmoke,” Allie is overseeing building a house and Virgil is helping choose curtains! Everett is a bit surprised by his friend’s behavior. Bragg, his men, and two newcomers to the town eventually use the budding romantic relationship to their advantage. I liked the way that the film built things up, often in unexpected ways. Issues that come across as simple in old Westerns are not so here. (Remember that old Hollywood had to deal with stricter censorship codes.) In those films, you had the bargirls/whores, married woman, and little girls- that’s all. There weren’t many respectable single women hanging about. Viggo’s character, we learn in the opening narration, is a West Point graduate who served in the Civil War. But his heart was not in “soldiering,” so he traveled West. He helped Virgil out of a tough situation, and the men became partners. Their friendship is very strong- almost like that of brothers. In one great scene, Everett has to (physically) stop the older man from doing something rash. There are humorous little moments, too. Virgil has trouble with long, complicated words- Everett fills them in for him. Jeremy Irons is pretty good as a evil guy, though I kept expecting him to revert back to his English accent! (I guess we’re not used to seeing him as an American much.) The scenery, music, and small characters all work well together, too. Appaloosa is a very well-made, intelligent film with different layers. It makes you think!